Released in 2013, the original Conjuring film successfully launched a franchise of horror films. Not only did the film spawn a sequel, it also set the stage for Annabelle (2014), a spin-off film focused on a possessed doll that merited a prequel. 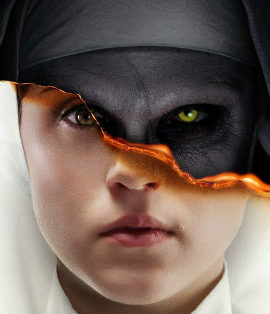 The Nun, the latest standalone entry in the series, expands the franchise even further. Focused on a possessed nun that haunted one of the main characters in The Conjuring 2, this film takes place years before the other films. When she’s first introduced in this feature, the title character appears a psychotic spirit haunting a Romanian convent in the early 1950s. She’s a mysterious figure that hides in the dark, willing to confront her potential victims. After the death of a nun at the convent, the Church enlists the guidance of Father Burke (Demian Bichir), a man who has confronted demonic spirits in the past. Burke is aided by Irene (Taissa Farmiga), a young woman in the process of becoming a nun. Burke and Irene travel to Romania to investigate the situation. The duo are joined by Frenchie (Jonas Bloquet), a local man who discovered the nun’s body. Director Corin Hardy sets the scene nicely, presenting the convent as a creepy arena where evil lurks freely around the halls. The story takes its time establishing the creepiness of the secluded convent and showing all of its strange (and haunted) surroundings. The screenplay by Gary Dauberman sets up some nice character development here and the story’s focus on three main characters gives the actors breathing room to establish their backgrounds. Bichir is particularly well-cast as a knowing priest who has seen the ugliness of supernatural forces and is haunted by the repercussions from an exorcism he conducted years earlier. The backgrounds of Burke and Irene are introduced through the dialogue between the duo. Frenchie, on the other hand, isn’t give much of a back story and that complements the story nicely. He’s introduced as a flirtatious local who would rather be anywhere other than the convent (who wouldn’t be?) and the charismatic Bloquet steals a few scenes with some great one-liners. It’s a testament to Hardy that the film’s suspense doesn’t lessen even when a joke makes its way into a scary sequence. There are plenty of scares here though and one of the film’s greatest assets is its ability to build scares upon scares. One scene in the cemetery particularly stands out for its willingness to surprise the audience with one twist after another. 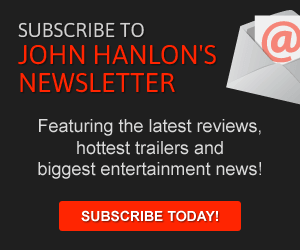 There are a few great surprises here and it’s exciting to see how the filmmakers continuously work to raise the stakes to keep the audience engaged. At times, there are definite moments though when the characters make inexplicable decisions. The two leading characters — visiting this convent as strangers in a unique world — split up from each other at inopportune times. In the film’s final third, they each follow their own paths despite the dangers that undeniably surround them. Such decisions distract from the feature’s momentum. That being said, The Nun commendably accomplishes its goal. It builds up tension and suspense while introducing the psychotic title character. It’s a great addition to the long-running series with some truly great sequences and some solid characters. One only hopes that some of the characters in the next film stick together when they realize that another spirit may be on the loose.